Added on September 28, 2013 by Ken Maldonado. 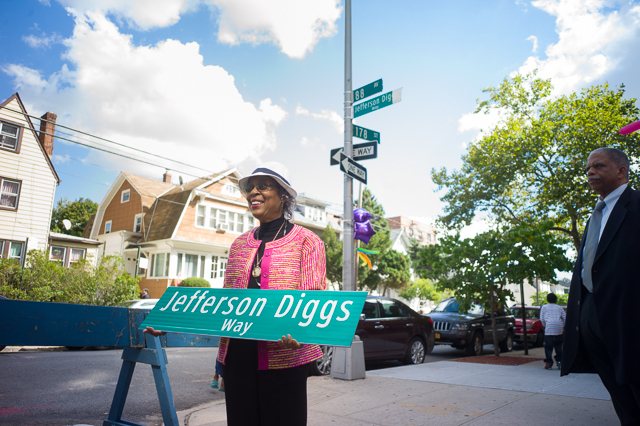 Sonya Geder-Diggs holds up a copy of the sign which marks a portion of 88th Ave. in Jamaica as Jefferson Diggs Way in honor of her late husband. Mr. Diggs was one of the first black reporters hired at the New York Daily News and in recent years was a well known community leader. Mr. and Mrs. Diggs have lived on the street for over 30 years.